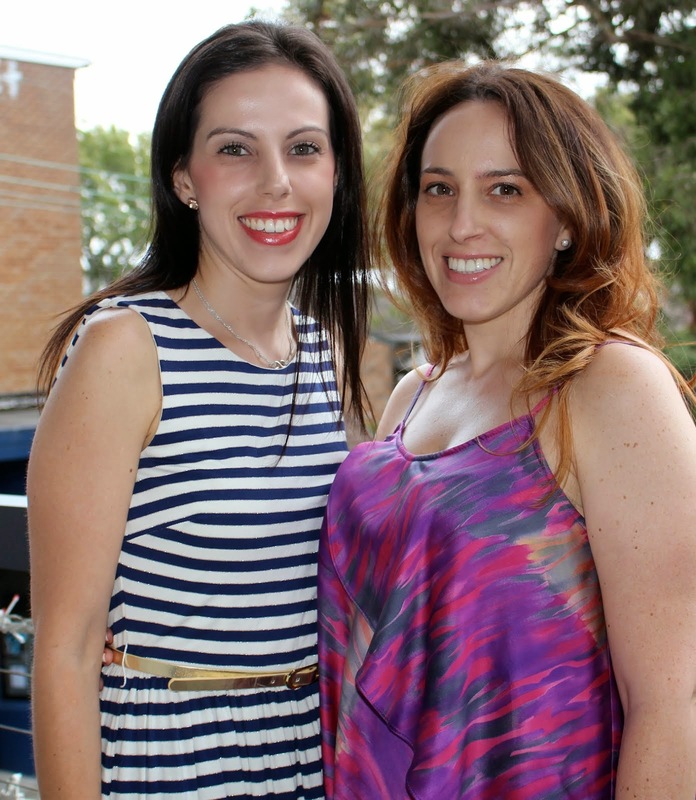 Two Silly Sisters: Anyone craving a Tim-Tam? For all of you that don’t know, the Tim-Tam is one of Australia’s favourite Arnott’s biscuits. What is there not to love about it? Two chocolate biscuits sandwiched together by a chocolate butter cream and dipped in chocolate… absolute heaven! I have never met a fellow Aussie that did not love a Tim-Tam. Unfortunately for all my coeliac readers, you will also know that there is nothing quite like it in the gluten free world. So I got thinking… what if I made a chocolate dessert based on the great Aussie favourite. 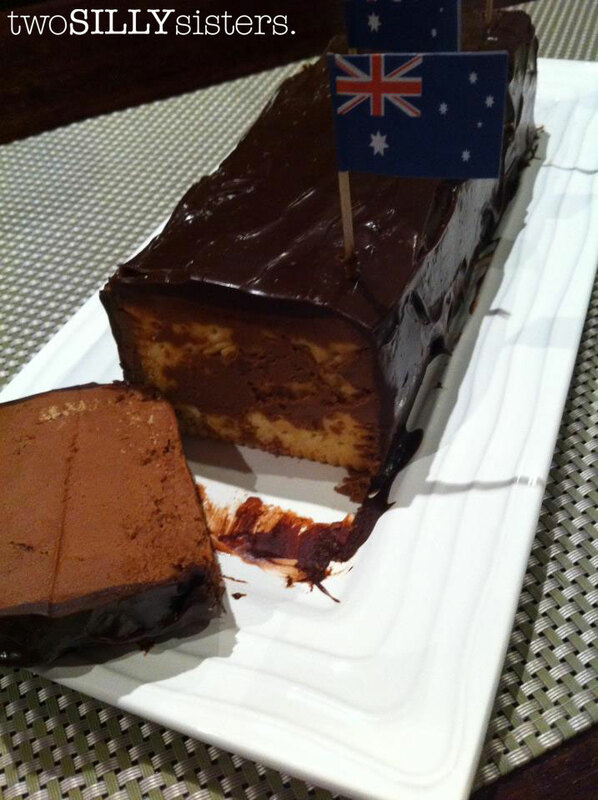 And here you have it… the Tim-Tam inspired biscuit log! Warning: This recipe is deadly sweet and definitely not on the diet list! 1. Place butter and sifted icing sugar into a bowl. Beat until light and fluffy. Set aside. 2. Half fill a medium saucepan with water. Bring the water to a simmer. Place 150g of the chocolate into a heatproof bowl and place over the simmering water (making sure the bowl does not touch the water). Stir chocolate, over low heat, until melted and smooth. 3. Add melted chocolate and milk to the butter mixture, and beat until smooth. 4. Spread a spoonful of butter cream onto one side of a gluten free biscuit. Place another biscuit alongside and sandwich together. Place biscuits upright on a serving platter. Continue layering remaining biscuits and butter cream to form a log. 5. Spread remaining butter cream over top and sides of log to fill all gaps. Smooth surface. Place in fridge to cool while making ganache. 6. To prepare the chocolate ganache, break the remaining 200g of chocolate into small pieces and place in a large bowl. Heat cream in a small saucepan, over low heat. Bring to boil and remove from the heat immediately. Allow to cool for a couple minutes. 7. Pour hot cream over chocolate pieces and set aside for 10 minutes. Using a whisk, mix cream and chocolate together until smooth. Cool the ganache in fridge for 10 minutes, until it reaches room temperature and thickens. 8. Pour over the biscuit log and smooth using a spatula. Chill in the fridge for approximately 30 minutes, until the ganache sets. Serve biscuit log at room temperature. TIP: Why not make your own GF Tim-Tams! Simply sandwich 2 biscuits together with the butter cream and cover with ganache or simply melted chocolate.